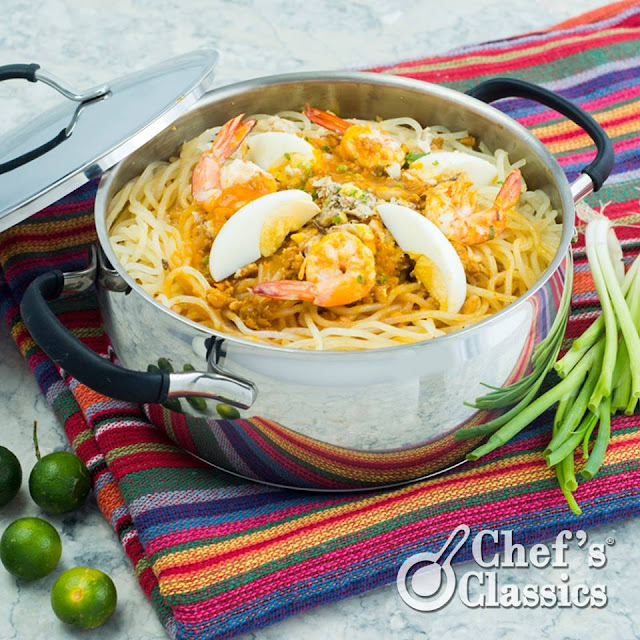 Palabok is a true favorite in our Filipino cookbooks. Though it may seem daunting to cook, the recipe is actually easy. Who needs that delivery number when you can cook Palabok right at home? 1. In a Chef’s Classics Camomile Sauce Pan, heat the oil over medium heat. Sauté garlic and onions. 3. Mix in the flour and stir well. 4. Add annatto, fish sauce, shrimps stock and pork broth. Bring to a boil and simmer for 5 minutes. 5. Simmer until sauce becomes thick. 7. Transfer the cooked noodles to a serving plate and pour the sauce. 8. Arrange the toppings over the sauce and garnish with green onions.